So, Duped is fast approaching release! In fact, we’re only about a month out from the actual, factual release of my first commercially available game. Fun times! So – one of the things that I haven’t really been thinking about that much is Marketing. It’s capitalised there, because that’s how I see it. Marketing. It’s an opaque entity that determines whether this game that I’ve poured so much of my time and soul into will be successful or not. Despite the research into how to do it, I still do see it in part as a final boss to defeat. It’s scary. So, I’ve been brainstorming ways to take chunks out of it, piece at a time. The one I’ve been working on for the past week or so is a demo. It’s a pretty obvious tactic, give a chunk of the game out for free, so that players can evaluate it for themselves. The most offputting thing about Duped (in my opinion) is the art. It’s generic, and while it suits the game, it isn’t exceptional. Duped isn’t that long of a game, and giving out part of the content for free means that players who come from the demo get around 1/5 of the game spoiled for them. Duped doesn’t beat you over the head with it’s themes. It is slow and methodical, so I can’t just bring in content from the full game and expect the demo to give players the full experience. Above you can see the first level of my solution. 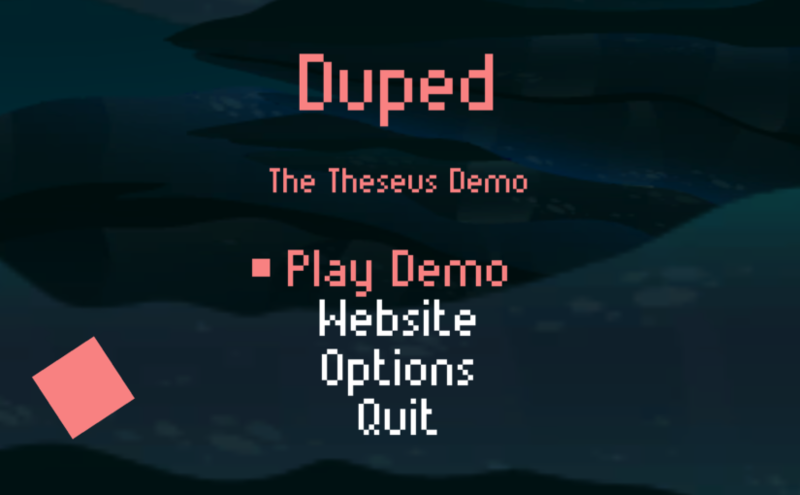 It’s called Duped: The Theseus Demo. It’s 9 levels. 3 new levels, and 6 “reskins” of levels from the same game. Let’s talk about how I came up with it, and how it solves the problems I mentioned above. The most important thing to me about building this demo was that it was representative of the themes of Duped. The main ones, to me, are isolation, identity and forming attachments. While these are subtler in the main game, I wanted the demo to address these head on. So, I built the demo around an old thought experiment called The Ship of Theseus (also known as the Grandfather’s Axe). If you’re unfamiliar, you can check it out here. So, obviously the themes overlap. Duped is all about identity, cloning and replacement, as is the Ship of Theseus. So, I decided to base my demo around this thought experiment. I do that old thing of building levels out of text, where the text of the levels is the text of the thought experiment. A bit indie, and a bit generic, but it helps get the themes across and gives The Theseus Demo an interesting style. It doesn’t use most of the art from the main game. The Theseus Demo uses the background images, but replaces platforms with text. This text, while not appearing at all in the main game, is stylistically consistent with the simple box art style, so I don’t believe it’s misrepresentative. More on this later. It recreates levels. Above you can see a comparison of the same level from the demo, and from the main game. Players don’t recognise levels in the demo as the same levels they play in the full game, and it doesn’t feel like they’re getting shortchanged by playing “the same” levels in the full game. The themes in the demo are a lot more obvious. While this is kind of clunky, I think I’ve hit a pretty good middle ground between hitting you over the head with the themes, and making them as subtle as they are in the full game. As an example, this level (the fifth level from the demo) is all about creating clones. As you play through it, the text describes the actions you’re forced to take, until you reach the end. Soon, no original parts remained. Even if players don’t read the text, the final sentence (or even the emphasised final word) gives players all they need to know about the themes. You’re replacing yourself, and soon no original parts will remain. To emphasise this, the final level of the demo forces you to make a choice. Which one is the Theseus? You are forced to choose one clone to be the “real” one. It’s essentially a meaningless choice, as neither of the clones you have with you at the moment are the ones you started with, but it does force you to consider the core theme of Duped. You’re making clones. You don’t have an individual identity, and if you ever did, you left it behind a few levels ago. So, thats the Theseus Demo. It ends with a quick look at the platforms (with screenshots of the game in motion), and then lets you exit & takes you to the website (where you’ll be able to buy the full game). I thought it was a pretty neat way to solve some problems that are faced around demo creation, while still building the actual demo fairly quickly (around 2 solid days of work in total). 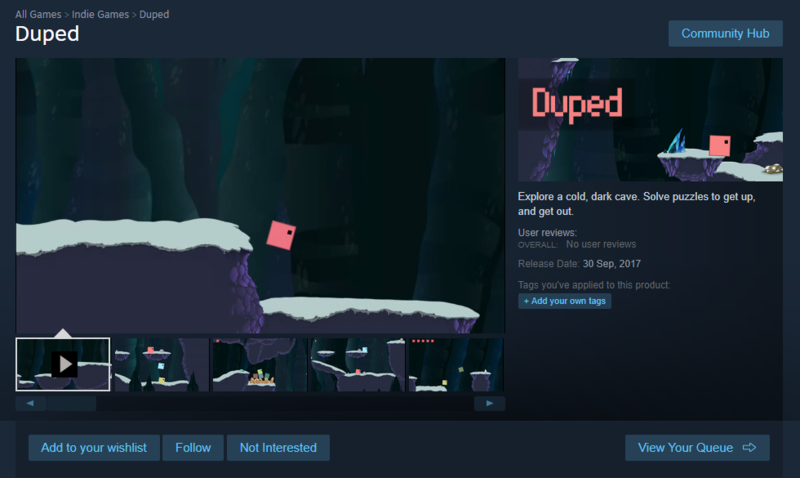 Stay tuned, because the steam page for Duped is coming soon!